Motors come in two basic designs: TEFC and ODP. TEFC stands for Totally Enclosed Fan Cooled and is the motor type of choice for dusty situations like the back side of a belt grinder. ODP (Open Drip Proof) motors are common on drill presses, but because they are open, they are a poor choice for harsh environments. On a TEFC motor the fan is located outside of the motor and forces air over the motor casing. 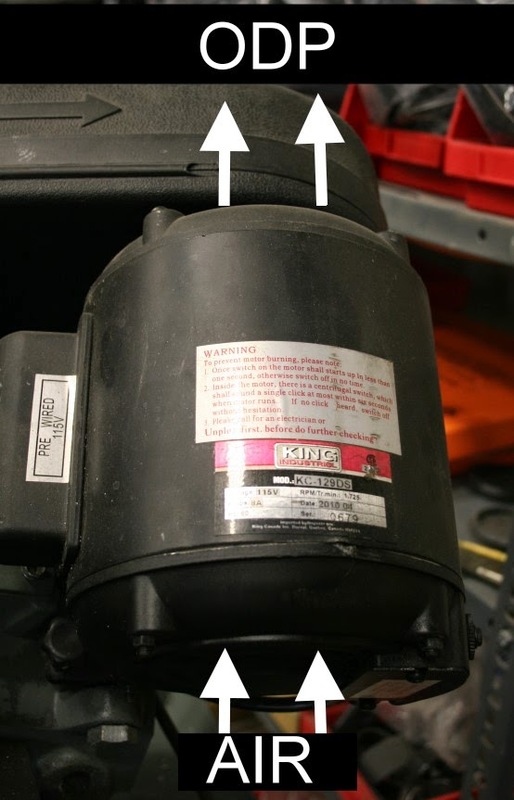 On an ODP motor, the fan is inside the motor and air is allowed to enter the motor through openings in the casing. Of course, dust will go with the air. In my opinion, the TEFC is a better choice for any application, but it's a more expensive choice. Single phase motors are great for running all sorts of equipment and are directly powered from the two hots (240 V) or a hot and neutral (120 V). Single phase motors cannot make a rotating magnetic field. The magnetic field essentially goes back and forth, not around and 'round. This back and forth means the motor doesn't know which way to rotate and without some assistance would simply sit there and hum. To get them to rotate the same way every time we can add a starting capacitor to the single phase motor design. The same can be achieved with a separate starting winding. These encourage the motor to rotate in a given direction. Once the motor is up to speed a centrifugal switch disables the capacitor or start winding. This can be heard in many motors as a click when the motor starts. In three phase motors there is a rotating magnetic field. This is supplied by three separate voltages that are created by a large rotating a generator over at the power generating station. 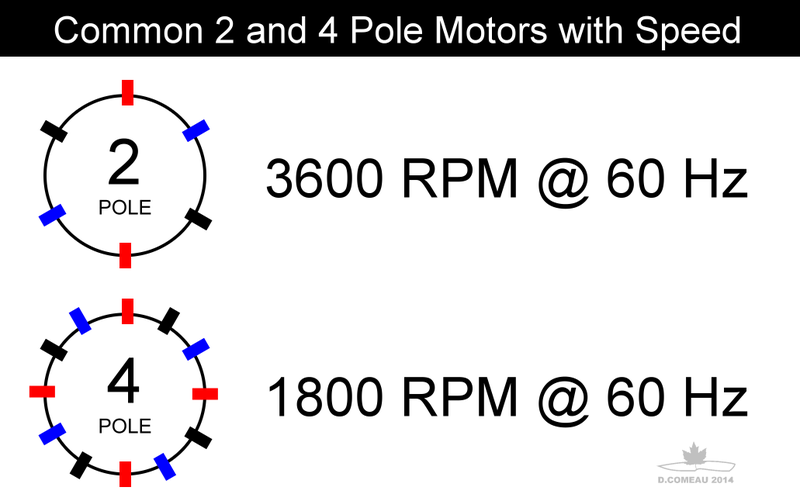 No rotation issues arise and swapping any two of the three phases results in the motor running the opposite direction. As the VFD will be supplying all three voltages to the motor, a three phase motor will be required. Additionally, the VFD can handily reverse the motor rotation without swapping wires. Motors are typically sized for the application, that is, the work that has to be done. Luckily, their horsepower rating helps describe how much work they can do. A belt grinder that gets worked hard should be at least 1.5 horsepower. Of course larger horsepower usually means more money. Remember there is a limit to the horsepower that a single phase supplied VFD can run. Most manufacturers make single phase drives up to 3 horsepower. Larger sizes of VFDs normally require three phase power in your shop. 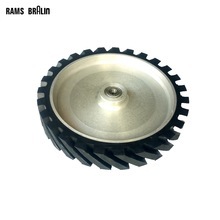 If you are building a belt grinder, you need to be looking for a motor between 1 and 3 horsepower and if you are going to install a VFD, this motor must be a three phase motor with 208V to 240V windings. Motors are built to run at different speeds. Yes, there is one more electrical parameter to consider. General purpose motors are commonly constructed as 4 pole (slow) and 2 pole (fast). This is the makeup of the motor itself and it defines the how fast it spins given the frequency of the supply voltage. In fixed speed motors, the power line frequency (60 Hertz in the U.S.A. and Canada) largely determine the speed of the motor. If I took my motor to France or Australia and plugged it in, it would run slower as these countries have a power line frequency of 50 Hz. Without getting overly complicated, in North America, let's say 4 pole motors are 1800 RPMs and 2 pole motors are 3600 RPMs. The actual RPMs on the nameplate are the loaded speed ratings and are generally 1740 and 3450 RPMs, but some will vary slightly, say 1730 or 3470. When the motor is loaded up it "slips." It is important to know the RPMs of the motor you want as this will influence the speed of the belt and the SFM (Surface Feet/Minute) the belt will be moving past your tool rest at. A belt grinder's drive wheel is equally important in this speed equation. Envision a typical 4 inch drive wheel on the grinder. Now hook up your 1800 RPM motor. All done? Now fire it up. The belt will be traveling at 1884 SFM. Change your motor out with a 3600 RPM one. With the same 4 inch drive wheel the belt is now whizzing by at 3769 SFM. surface inches per minute divided by 12 gives us surface feet per minute. Oh the complications! Well it's pretty easy to sort out. Go for the fast motor! VFDs can handily slow a motor to 50% of its usual speed, but not always make the motor go 200% of its usual speed. It is fair to say that the cooling of the motor will be reduced as the motor's fan will be running at half speed, but from experience I can say that well built motors have fans intended to keep the motor cool at the 4 pole speed. If you planned on using it all day long at half speed, then some supplementary cooling may be required or an inverter rated motor may better suit your needs. So add one more piece of info to our motor wish list. Let's get a 3450 RPM motor. 2 Pole (3600 RPM) motor. The last detail that needs to be attended to is a mechanical one; which is the way the motor is mounted. 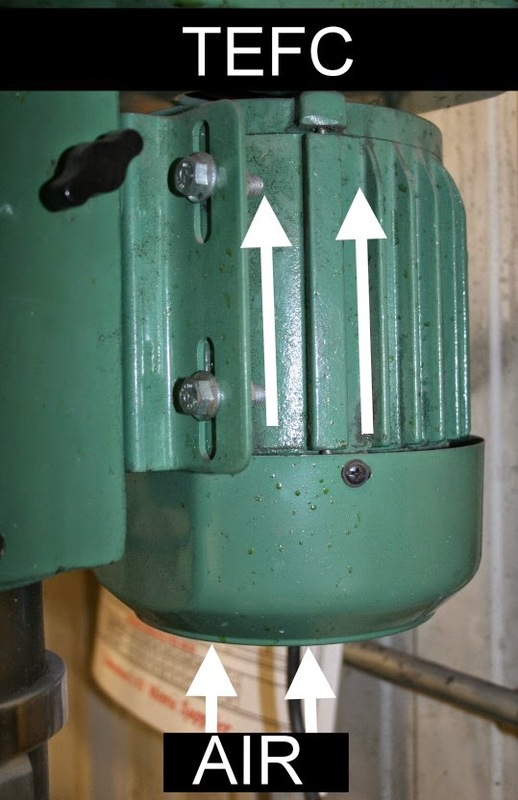 Some grinders have 'C face' mounting where the motor bolts directly to the unit. This is great as there are generally no alignment problems. With other grinders, you need to bolt the motor down to base plate with its mounting feet/pads. Only your grinder can say what type of mount to use. The nice thing about C face motors is that they can be mounted with regular foot mounts as well. By now you should have all the details you need to buy a motor, but before you do let's look closer at the VFD and how it's going to be installed at your grinder. For more information on motors for belt grinder applications check out my in-depth look at induction motors. I would like to ask you some questions pertaining to this post but cannot find any link to contact you directly. Is there an email address that you can be reached at? Drop me a note at knives@dcknives.com. I also have a post that covers induction motors for belt grinders in more depth here.